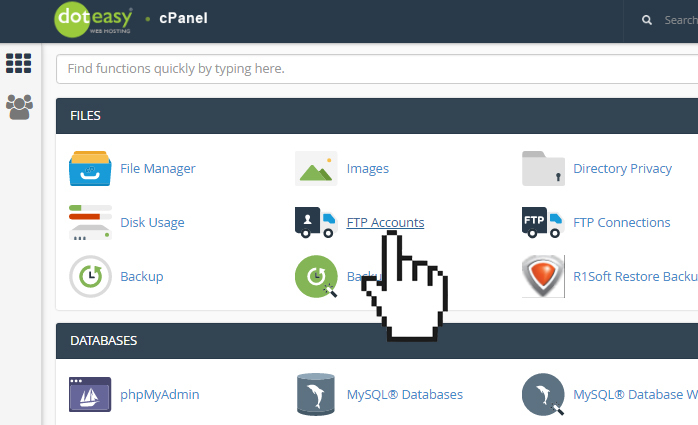 You can manage existing FTP accounts using the FTP Accounts tool in cPanel. Click FTP Accounts under Files in cPanel. Under FTP Accounts, click Change Password for the FTP account you want to change password. Enter and confirm the new password in the passwords fields. When ready, click Change Password to complete the process. Under FTP Accounts, click Change Quota for the FTP account you want to change quota. Enter the new disk space quota, or select Unlimited. When ready, click Change Quota to complete the process.